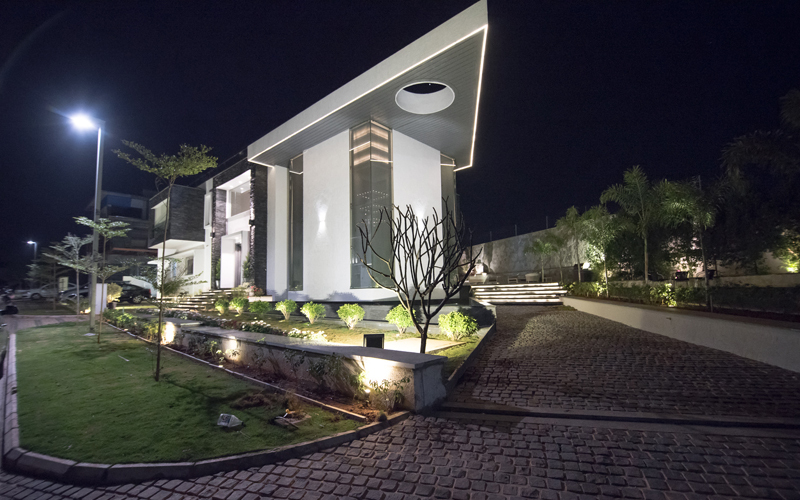 Interior designer Athulya Reddy lives in a beautiful house in a gated community called Ektha Prime High Land Park, in the Gachibowli Financial District. She lives with her husband, Kamlesh Reddy, President of Superior Fragrances, Inc., and their two children, Aishwarya and Amay. The house – with a built-up area of approximately 9,300 square feet – has three floors and five bedrooms that are designed with a contemporary theme, and a colour palette consisting of a grey base with contrasting colours. The architect who worked on the house was Vardhishnu Balagari from Worthy Associates, while the interiors were done by Athulya Reddy herself, who has designed couple of other houses, including one in New Jersey, prior to this one. The home’s spacious entry foyer houses an interesting contemporary sculpture of Lord Ganesha under a lovely chandelier. There is another piece of art made of mirrors in the entry foyer, adding to the contemporary appearance of the space. 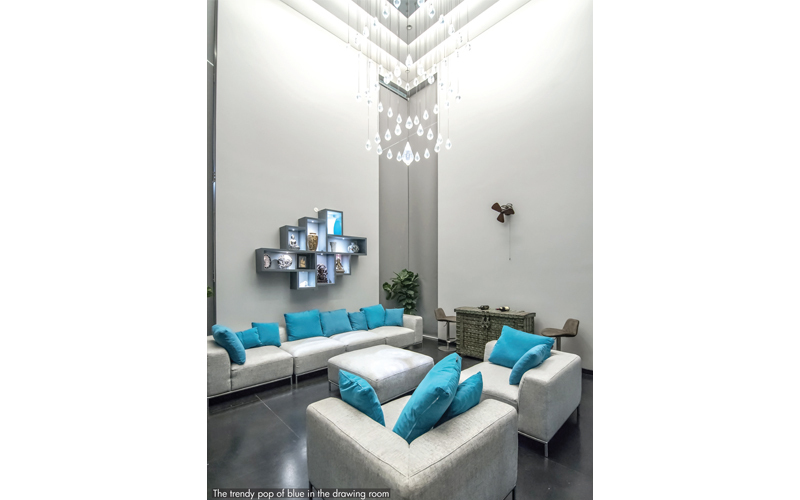 The drawing room has a cool colour palette with its grey walls and furniture, dotted with several blue cushions and lit by a well designed drop chandelier. 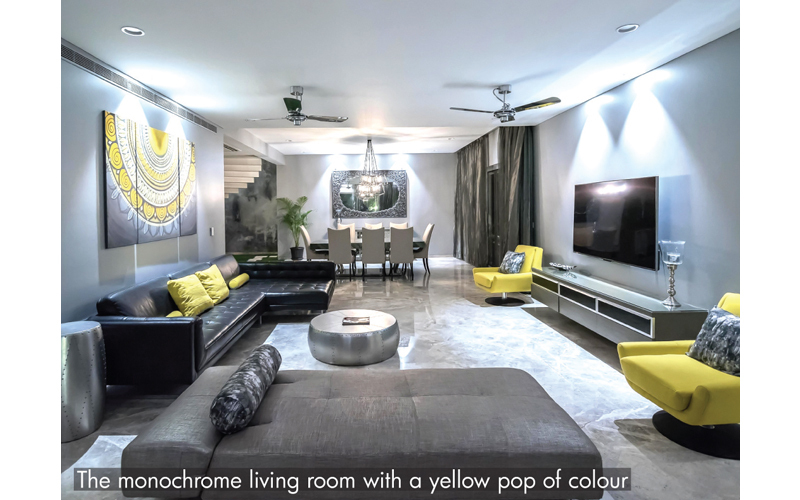 The family living room, on the other hand, uses yellow for a pop of colour, with two yellow sofas, yellow cushions, and an ethnic themed grey and yellow wall hanging. The house also has a home theatre. 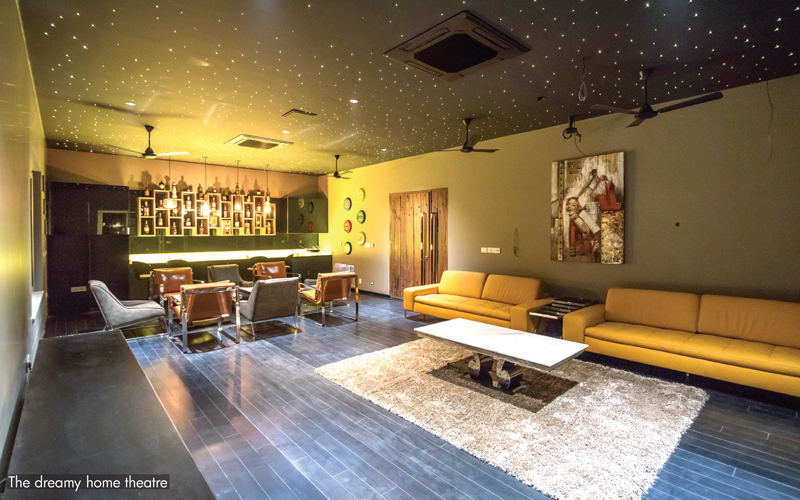 With its yellow and grey colour palette, well-chosen decor and spectacular starry ceiling, it certainly makes for the perfect movie-watching experience for the family. The master bedroom has a regal look to it, with a silver, white, and grey base, punctuated with a royal blue headboard and cushions. 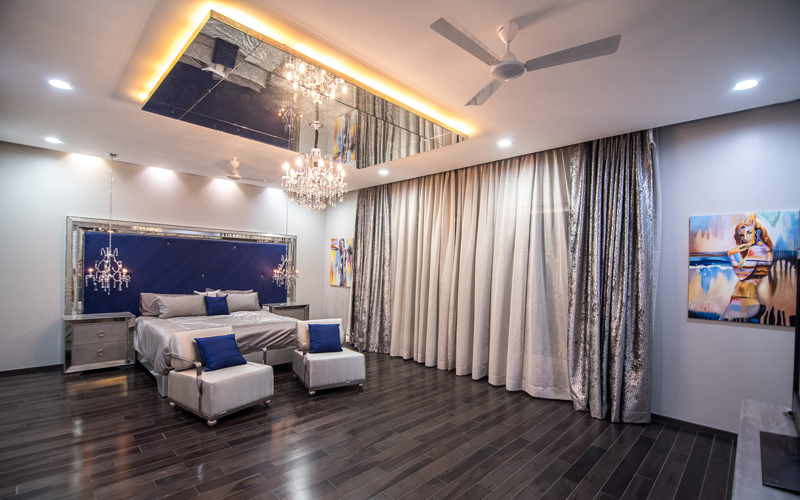 The exquisite chandelier, teamed with the mirror on the ceiling, satin sheets, and tastefully chosen paintings on the walls give the room a very luxurious feel. Athulya’s daughter Aishwarya has a Paris-themed bedroom, with a pretty shade of cyan as its colour theme. One wall is aesthetically covered in pictures of her, and pictures and symbols representing the City of Fashion. Amay’s room, on the other hand, has a more energetic ambience with a lemony green-yellow colour pop. 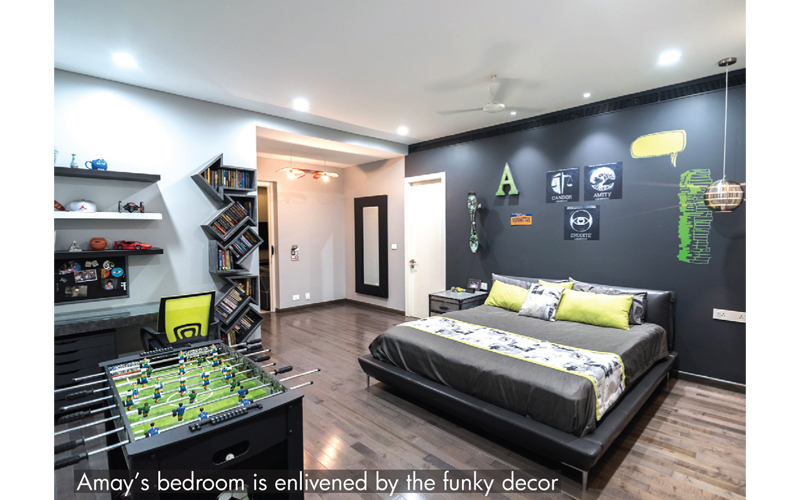 The modish arrow-shaped bookshelf, along with the posters and stickers on the wall, and the foosball table gives the room a fun and funky appearance. The flooring running throughout the house is mostly of marble, granite, hardwood, and vitrified tiles. The walls, meanwhile, have been painted in muted greys, making the overall appearance very sophisticated. The furniture used in the house was sourced from the US and China, two popular places for modern contemporary and minimalistic furniture. 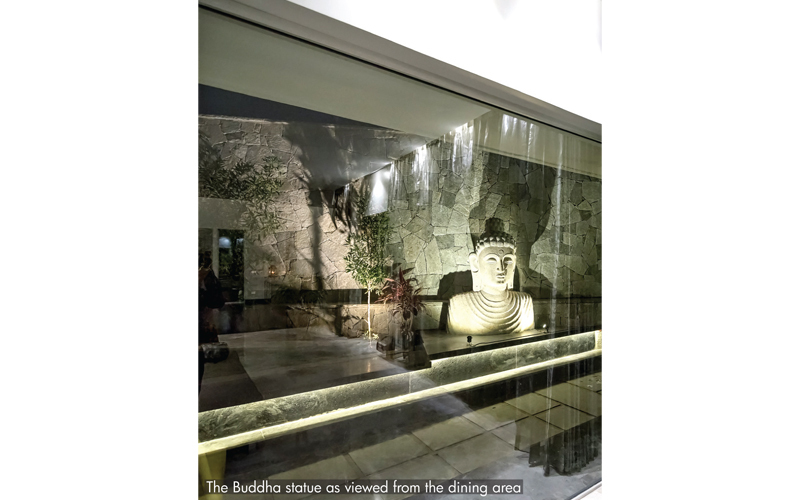 The more traditional artefacts – like the large Buddha idol and Ganesha statue – have been sourced from India. Athulya said, when asked about the kind of style she wanted for her house. She had an idea of the colour palette she intended to use and the theme of a pop of colour in every room. This, combined with her initial concept of contemporary elegance, gave birth to an aesthetically pleasing home. The exterior of the house is no less pleasing in its aesthetic appearance, and so the home is considered one of the most beautiful in the community. Summer White House of US President Arthur is for Sale!